We’re auctioning off the very first 12 pre-production Model A Raspberry Pis, with some other goodies like signed books, shirts and an Adafruit Pi Plate, to raise money for charities over the holidays. Only 12 of these pre-production boards will ever be made. The first two boards we’re auctioning end in under 24 hours; go and have a look if you want to own a piece of computing history. 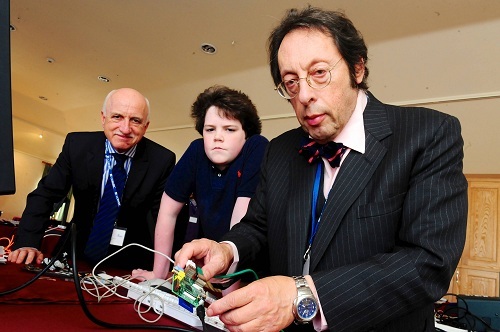 Jack Lang, a Founding Trustee of the Raspberry Pi Foundation and the Foundation’s Chair, is one of the most interesting people I’ve ever met. His career hasn’t just been fascinating; it’s positively surreal. He’s been an award-winning restaurateur, a developer for the BBC Micro in its very early days, and founder of a number of successful tech startups. He’s Entrepreneur in Residence at the Centre for Entrepreneurial Learning, lectures at the Judge Institute at Cambridge, and is a Fellow of Emmanuel College. He smokes his own bacon, has a brick pizza oven in his garden, writes for food journals, and makes Consommé à la Royale so wonderful it’ll bring tears to the eyes. He also has a licence for Class IV fireworks displays, and used to be a roadie for Pink Floyd. Jack is brilliant. Jack Lang, doing something interesting. As usual. Click to bid on Jack’s Pi. Jack’s chosen charity is one he has a long association with. The Humanitarian Centre is an international development network that connects people working in academia, industry, government and charities to develop more effective ways of working together to tackle global poverty and inequality. The Humanitarian Centre is based in Cambridge, and is affiliated with the University. Bid on Jack’s Pi here, or click on the picture.